When is it time to change your timing belt? Depending on your driving habits, climate, and manufacturer's specifications, you should be replacing your timing belt every 60,000 to 90,000 miles. It wouldn't be unusual for some to last longer, and it's possible that the belt could break earlier. As you approach big milestones like this, you should be listening for whining and squeaking sounds during start up and acceleration. Sometimes a timing belt will exhibit signs of physical wear (usually cracking or fraying) and give hints that it needs to be replaced in time for you to do so. Failure to do this at the right time could result in catastrophic damage to the engine's internals. When a timing belt snaps, the camshaft and crankshaft are no longer rotating in unison. That means that the valves inside the cylinder head can be left open while a piston could rise up and collide with it. That results in bent valves, and those are much harder to replace than a timing belt. So when it comes time to perform routine maintenance, don't skip this step. For every 4-stroke engine, the crankshaft will rotate twice while the camshaft rotates once. This is managed by the pairing of two gears (one on the crank and one on the cam). For the better part of the 20th century, a chain was used to synchronize the rate of revolutions of these two parts. This proved to be a strong and durable design, however not as efficient as a timing belt. Belts are less expensive to make, will operate quieter, and are much lighter than chains. 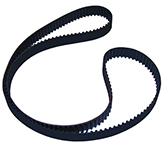 As a result, most automotive manufacturers began to favor timing belts by the 1980s. Today they are vastly more popular than chains, however will require replacement more often. Timing belt replacement: more difficult than you think. Unless you have an engine hoist and dolly, replacing your timing belt is going to be a difficult task. It is going to be protected by a plastic or metal cover, and you will likely have to remove all of your drive and serpentine belts before you can get to it. That may also mean the removal or disconnection of coolant hoses as well. For the lucky few, you may be able to access the upper section of the cover from above and the lower section from below the car. It would require a lift and jack stands, but can be done sometimes. Still, lifting the engine out of the engine bay is always the easiest way to change your timing belt. Remember to align the timing marks on your crankshaft and camshaft(s) to 0* and loosening the tensioner before removing the timing belt. This will make replacing it with a new one much easier. It should go without saying that we recommend professional installation. Get your engine running again. If you are in dire need of a new timing belt, we've got you covered. Our belts are made by all the top manufacturers used by domestic and import automakers. None of the timing belts you will find on our website are below OEM quality. In fact, we carry many of the original equipment brands that you'll find at your dealership for a fraction of the price. Plus, we can ship right away; keeping your downtime to a minimum. So don't delay, shop our website and place your order today. If you wait and your timing belt snaps, your valves and head could be permanently damaged when impacted by the pistons, leaving you stranded with a much more expensive repair bill.